Mountain View, CA – In a surprise announcement internet powerhouse Google today revealed that it had acquired the western European country of Luxembourg. Google gave no indication of what possible use the search engine giant could have for a small country, but speculators have begun to fear a software industry land-grab as hours later Microsoft announced that it was in the process of acquiring the African nation of Lesotho. 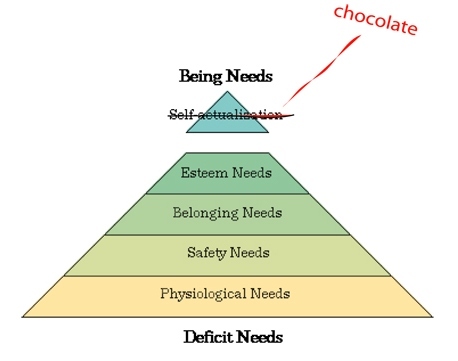 Key West – The Institute of Cognitive Institutions today announce that longtime psychological model Maslow’s Pyramid has been revised by the Institute’s board of review, replacing self actualization with chocolate as humanity‘s greatest need. Created by Abraham Maslow, the pyramid describes the progressive nature of human motivations, starting with basic needs like food and safety near the bottom and moving to progressively higher needs as each one is met. In the original model, self-esteem needs were followed by self-actualization which included accepting individual weaknesses, being unafraid of failure and transcending selfish interests. Although many psychologists oppose the move, citing psychoanalysis as humanity’s greatest need, recent studies seem to support the ICI decision, linking chocolate intolerance with aggression, warfare and political aspirations. Yes, the headline is the single most important part of any story, assuming of course, you wish it to be read. A bad story is not good, but a bad headline is evil. By Randolph E. Schmid, Associated Press Writer. Chimpanzees may have been using stone “hammers” as long as 4,300 years ago. An international research team, led by archaeologist Julio Mercader of the University of Calgary, Canada, said Monday it had uncovered the hammers, dated to that time, in the West African country Ivory Coast. It would be the earliest known use of tools by chimpanzees. The hammers were used to crack nuts, a behavior still seen in chimps in that area, the researchers said in a paper in the online edition of Proceedings of the National Academy of Sciences. The finding may indicate that a “chimpanzee stone age” began in ancient times, the researchers say. I chose this particular story for its extreme badness. Saskatoon – Today Britney Spears testified before congress in a non-binding video deposition from her rehab facility in the Scottish Highlands. Pointing to security breaches in historical events found in the wake of Katrina, she briefed legislators on her latest developments in the field of primate anthropology. It was a short session. However, since most journalistic organizations are more interested in “accuracy” than flair, we will have to limit ourselves to merely re-crafting the headline. Sorry, I drifted off there for a minute. See how easy that was? Quality journalism doesn’t have to be difficult. So there you have it, even though the story itself is still in danger of violating the Geneva Convention due to inhumane levels of boredom, we might still snare some unsuspecting readers, thanks to our newly improved headline. That’s all I have for now. Come back next time and I’ll show you how to transform complete strangers into “highly respected sources” and then bend those sources to your newsbreaking will.